For further general information about the mathematics program, please consult the CCNY Course Bulletin. What levels of math does the department offer? For entering students who intend to study calculus, but are not yet prepared for it, we offer two courses: Math 19000 (College Algebra and Trigonometry) and Math 19500 (Precalculus). Math 18000 (Quantitative Reasoning) and Math 18500 (Basic Ideas in Mathematics) serve students preparing for teaching in the elementary schools. Math 15000 (Mathematics in the Contemporary World) is the basic math core requirement for everyone else. We have two calculus sequences: Math 20100, 20200, and 20300 (Calculus I, II, and III, respectively) for engineering, math and science students, except biology majors. The latter take Math 20500 (Elements of Calculus), along with architecture and economics majors. Biology majors also take a second course, Math 20900 (Elements of Calculus and Statistics). Beyond calculus we offer a range of courses for advanced students in mathematics, science, and engineering. You can study the foundations of mathematical analysis and modern algebra, delve into the mysterious world of non-euclidean geometry, master the theory and application of probability and statistics, and explore the arcane reaches of mathematical finance. I am beginning at CCNY. How do I know which math course to take? If you are a freshman you will be given a placement test. Currently, CUNY is using a mathematics placement test developed by ACT. You can get information about this test, including sample questions, from the CUNY Office of Academic Affairs. Based on your score, you will be notified of your possible math placements and a college advisor will assist you in selecting an appropriate course depending on your goals. If you are a transfer student, the College will evaluate your transcript to determine the correct placement based on the course work you have completed elsewhere. Can I get credit for Advanced Placement work? If you have taken the College Board Advanced Placement test in calculus and scored sufficiently high, you will receive credit for your work and your mathematics placement will be determined by your advanced standing. For a score of 4 or 5 on the Calculus AB exam you will receive credit for Math 20100 (or 20500). For a score of 4 or 5 on the Calculus BC exam you will receive credit for Math 20100 (or 20500) and Math 20200. A score of 3 on the Calculus BC exam receives credit for Math 20100 (or 20500). We also give credit for Math 17300 (Introduction to Probability and Statistics) for students scoring 3 and above on the AP Statistics exam. Can I take math courses at other colleges on permit? If you are currently a full-time student at City College then you are expected to complete your basic math courses at The College. This policy applies to all math courses at the level of calculus and below. Permits to take upper level courses at other institutions will be evaluated on a case-by-case basis. Applications for permits may be made online through the CUNY Portal. The Math Help Desk located in J418S provides free tutoring for students in all courses in calculus and below. The Division of Science provides additional support for prospective science majors through the CCAPP program. Prospective engineering students should consult the PRES office in T2M-7. Is a math major right for me? Do you like thinking about mathematics problems? Do you enjoy discussing math with your friends? Are you curious as to how mathematics is used in our ever more complex world? Do you want to study a subject that will enhance your analytical and thinking skills? If you answered yes to any of these questions, you may want to consider majoring in mathematics. What can I do with a math degree after college? There are lots of things you can do: Start a career in the actuarial profession, work in the finance industry doing statistical analysis and financial modeling, pursue an MBA or a Masters in Mathematics or Statistics, teach math in the secondary schools, or go for a PhD in math and create the math that other people will use. In short, majoring in mathematics provides a training in rigorous thinking and problem analysis that finds broad application in many career paths. Check the careers page on this site for more information on the wide spectrum of opportunities awaiting today's math major. What background do I need to major in math? Math is a sequential subject, so you can't just jump in without a solid base. All math majors must complete the calculus sequence, Math 20100, 20200 and 20300. These courses cover the fundamentals of single variable and multivariable calculus. Although some advanced math courses do not use any calculus, the calculus courses cover many methods in algebra and geometry that are essential in much of higher mathematics. What does a math major take after calculus? We offer three options for majoring in math. What you take after calculus depends to some extent on which of these options you pursue. The options are Pure Mathematics (B.A. or B.S. ), Secondary School Education (B.A. or B.S.) and Applied Mathematics (B.S.). These are described in detail in the major description. Although there is overlapping in the requirements for these options, it is best for a student to consult with the Assistant Chair in planning a course of study and completing the documentation needed to register as a major. Students who are pursuing Childhood Education studies in the School of Education can take a special interdisciplinary concentration in mathematics to fulfill their major requirement. The courses in this program are described in the Math/Childhood Education fact sheet. I'm interested in majoring in math. Which option should I choose? If you have a specific interest in public secondary education - and the demand for high school mathematics teachers is insatiable - you should pursue the option in Secondary School Education. In order to obtain certification in New York State you will need to complete some courses in education. If you are thinking about pursuing an advanced degree in mathematics or simply wish to engage in a rigorous course of study that will prepare you for challenging professional opportunities, you should consider the Pure Mathematics option. 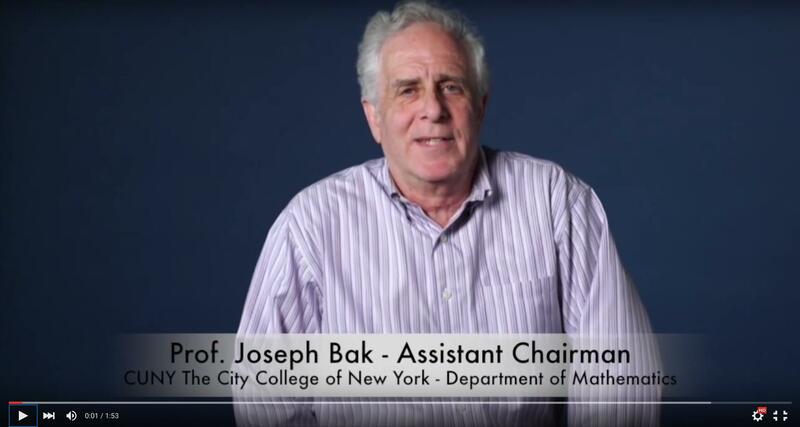 The Applied Mathematics program aims to give students the mathematical tools that are most needed in entry-level careers in the business and research communities. The program emphasizes probability and statistics, mathematical modeling and the use of computers in mathematical and statistical analysis. What opportunities does the Department provide for majors? We offer several scholarship programs that provide full tuition for one to two years for outstanding majors. The Department has additional awards, both monetary and academic, that it gives in recognition of student achievements. We also provide a number of paid summer internships for students in business and government. Majors are also encouraged to apply directly to other institutions that sponsor residential summer research programs funded by the National Science Foundation. The Assistant Chair will assist students in selecting a suitable program. Math majors who wish to work on campus in a job that will also enhance their academic skills are encouraged to apply as tutors for the Math Help Desk. Applicants should have completed the calculus sequence with a 3.0 average, and at least one of the following courses (Math 34600, Math 39200, or Math 39100) with a grade of B or higher and have a Math GPA (calculus and higher) of at least 2.75. Can I take graduate math courses as an undergraduate? Undergraduates who have the appropriate prerequisites may register for A-level graduate courses. These will be credited towards their undergraduate degree. Please check the schedule of graduate courses for the proposed offerings. Undergraduates wishing to take a graduate level course need approval from the Assistant Chair. Are there opportunities for undergraduates to do research? The Department awards a degree with honors for students who complete the appropriate course of study. Professor Thea Pignataro is the department Honors coordinator and students interested in the honors program should consult with her by the beginning of their junior year. Can I minor in math? Yes, students can obtain a Minor in Mathematics if they complete the following requirements. The calculus sequence (Math 20100, 20200 and 20300) plus a total of twelve credits in math at the City College in 30000-level courses or higher, which includes one of the following: Math 34600: Elements of Linear Algebra or Math 39200: Linear Algebra and Vector Analysis for Engineers. Engineering students can usually complete the Minor by taking two mathematics courses in addition to those required for their degree. Upon completion of the requirements, students must file a Minor declaration form via the Department's Major Advisor.